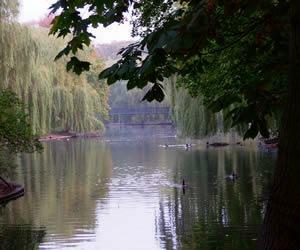 Upper Lea Valley Walk at LutonWalking RoutePrepare to enjoy this easy self-guided stroll from the source of the River Lea following the course of the river into a beautiful green area of the town then through Luton town centre. If you wish to extend the walk, you can continue into the Bedfordshire countryside to the borough boundary at Lower Harpenden Road. Leagrave Park is on the B579 Toddington Road to the north west of Luton town centre. Leagrave Park has two car parks, one at Bramingham Road and one at Sundon Park Road. Parking is available at Luton Airport Parkway Train Station. Start at Leagrave Park to follow the route south. Prepare to enjoy this easy self-guided stroll from the source of the River Lea following the course of the river into a beautiful green area of the town then through Luton town centre. If you wish to extend the walk, you can continue into the Bedfordshire countryside to the borough boundary at Lower Harpenden Road.